Our ninth post in a series counting down the 10 most influential books I’ve read this year – 2011. Jim Loehr and Tony Schwartz, The Power of Full Engagment, Allen and Unwin, 2003. Anyway… To reach #2 on my list of the Top Ten Most Influential Books for 2011 means this book must have something going for it… In fact it has three big things going for it. And this will give an big insight into how I judge, assess and value books… Plus, what I think should be included when you write your own book. Firstly, it needs a big idea. Not just a conceptual idea either. It’s need to be an idea that jolts me into acting, thinking or being differently. Otherwise, what’s the point? This book sparked this response in me! Big tick! Full Engagement is about managing your energy not your time. Simply put, your energy is more valuable than your time. How often have you made the time to do something only to fail because you don’t have the energy to make it happen? This was a big ‘Aha!’ for me. In particular, over the past few years I had trained myself to sit at my desk for long periods of time and churn out the work. I’d noticed I found this a drudge. It wasn’t natural for me to work this way yet I thought this was what I needed to do. Instead, Loehr and Schwartz point out you’re better off going for short sprints. This inspires energy. I’ve since changed the way I work for the better. A big result from a book! Not all books need to be ‘how-to’ books. I love the work of Seth Godin and Malcolm Gladwell. They provoke me to think in new ways. And, they don’t write step-by-step manuals. That’s what makes this book rare. It’s got a big idea AND a practical system you can implement. I’m still working through this book. In particular, it’s now the cornerstone of my planning for the New Year 2012. That’s a big endorsement as I already have a thorough system for planning. This book shows me how to add another level to it. 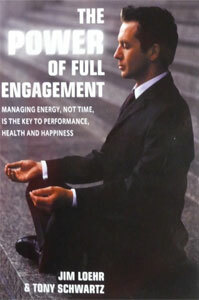 Specifically, the book focuses on four energy systems: physical, emotional, mental and spiritual. And, it’s talking about a practical view of the spiritual – not some hocus pocus airey-fairy version. I’d bet few of us manage ourselves across all four in the way that we could. The best analogy here is the high-performance athlete. We generally accept an athlete works across all four across these domains to perform at their best. Yet, most of us don’t take ourselves and our business seriously enough to do likewise. I’m now changing that! Supercharge myself to get supercharged results! Big Idea – tick. System – tick. Now, I want to see how this looks in action. I want some examples and this book does it well. It has a series of stories and case studies based on real people in real situations. And they’re in sufficient detail so you can feel the nuances at play. These stories are not only engaging, they personalise the message. Valuable as a reader. Crucial if you’re writing your own book! That’s the three things that make this book outstanding. Buy it to add more energy and more results to your life. And, buy it if you’re serious about designing a coaching system or writing a book.